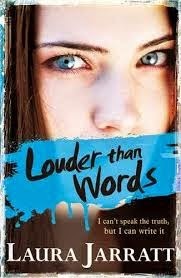 Laura Jarratt's Louder Than Words is right at the top of my TBR list as I loved her wonderful debut, Skin Deep, and her brilliant second novel, By Any Other Name! I was thrilled to get a spot on the blog tour for it and am delighted to welcome her to YA Yeah Yeah. This book is the only one I’ve ever written where real time events have shaped what happens in the book. From the very first idea about the hacktivists, stuff seemed to happen to direct and change what was going on in Louder Than Words. As soon as I started to think about it, a group called LulzSec hit the headlines and a high profile court case followed. I was already aware of a hacking collective called Anonymous and that they seemed to have changed their approach from trolling of anyone they didn’t like to a more moral agenda of attack, but then Lulzsec appeared. I kept an eye on the court case and the comments from the various accused. Those certainly began to shape the character of Dillon, and especially that God-complex part of him that you see from time to time. I did most of the writing of the book while I was on maternity leave. I’d pop the baby down next to me to sleep on a special pod and I’d write while she napped. Any new mother will tell you that you spend most of those early months sleep deprived so I needed lots of little breaks to keep my concentration up. This meant I’d stop every half hour for a break and because I couldn’t move from where I was sitting or I’d wake the baby, I spent time messing around on Pinterest and Twitter and surfing the net looking at breaking news that I wouldn’t normally have time to see. The cyber bullying part of the book had already been decided but when I was spending more time on the net every day, the sheer amount of trolling of women and aggression towards them was startling. There was one particular incident which really disgusted me. A bunch of girls from an all-girls school in my home city had done a display of pictures for an online promotion of feminism. It was harmless and unexceptionable stuff. Cue a revolting amount of trolling and aggression towards them for daring to open their mouths. In the end their school advised them to withdraw the pictures for their own safety. The internet was also full of articles on how girls were being treated in university – social events using advertising promoting violence towards women. That kind of thing is a complete shock to my generation – we’d have ripped those posters down as soon as we saw them and we just don’t understand why girls tolerate that and tolerate boys who treat them as if that’s just all one big joke. Obviously at the time I was writing Lara as a character. Writing characters can be a bit like method acting – you have to channel them and Lara was furious about this stuff. Some of that found its way into the book. Then of course there’s Josie and Rafi’s quote swapping and again when I was trawling around Pinterest being Josie it struck me how much time as women and girls we spend whining about hair and weight and getting boys and men to like us. So many quotes about being badly treated by guys. So why accept it? And why care so much that you let it hurt you. Josie was in that place, of course, where she wouldn’t accept any of that. There was a quote on there that I loved: a lion does not lose sleep over the opinion of sheep. My inner Lara and Josie really embraced the concept that you empower yourself against being a victim and hold yourself above that. Thanks for sharing, Laura! A fab post, and I can't wait to read the book.